Organizations struggle to develop a truly integrative, 360 degree view of their customers across online and offline touchpoints. But traditional data warehousing and BI approaches cannot keep pace with the size and complexity of data and these tools seldom offer appropriate ways to quickly visualize behavioral data. Furthermore, they cannot provide the necessary granular-level access to individual customer sessions or devices for marketing, personalization, and remediation. The marriage between Hadoop and Spark unleashes new big data capabilities for data-driven companies. 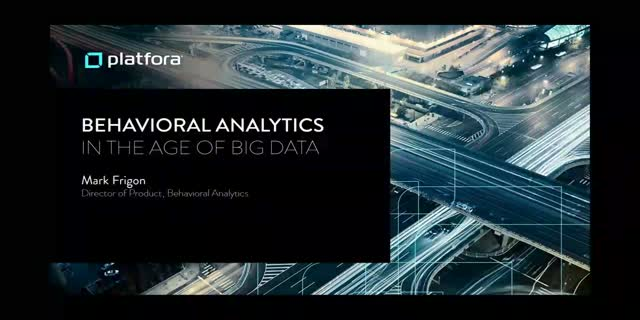 Learn how these organizations can now find and visualize big data insights at ease and speed with Hadoop, Spark, and Platfora. Built natively on Hadoop and Spark, Platfora’s underlying technology helps it fit in just about anywhere—including your existing analytics ecosystem, hardware and BI tools. For global financial institutions, it’s nearly impossible to keep up with market changes, regulatory changes, security concerns, and technology advancements. But the right big data discovery solution lets you quickly extract insights—and enables everyone across your organization to dig deep into your big data to stay ahead of market and compliance requirements. What’s more, you can view the insights directly in Platfora or export your findings into any BI tool you prefer. Behavioral analytics with big data discovery enables businesses to know their customers on a deeper level. Through a combination of advanced segmentation and event series processing capabilitiesy, Big Data Discovery can enable your business to discover hidden relationships and opportunities buried within customer behavioral data. Join this roundtable discussion with the Bloor Group, Speculist Media and Platfora to learn more. Companies have realized significant business outcomes using Modern BI technology. From achieving a 37% increase in adspend efficiency to avoiding a $1 million dollar advertising expense. Platfora’s Big Data Discovery has helped companies become truly data driven. Come see how Platfora makes finding — and visualizing — big data insights across your organization easier than ever. Find out how a major healthcare payer used Platfora’s Big Data Discovery to answer a business-critical $614 million question: What is the effect on medical claim costs of adherence to medication for our members under the age of 65 with Cardiac Problems? Data scientists don’t scale. In using them to do manual data preparation, you’re missing a huge opportunity to extract the most value from your intellectual assets. The good news? By automating and accelerating much of this raw data crunching and ETL work, you enable non-data scientists to do data preparation rapidly and simply—and ask their own questions and find their own answers. What’s more, in this new Big Data Discovery environment, answers come in minutes, not months. Data scientists are able to focus on Spark-driven advanced analytics that yield game-changing answers. 2016 is going to be a big year for big data discovery. Companies of all kinds are quickly realizing the game-changing business and bottom-line benefits that come from being able to understand your data. During this webinar, Tony Baer, Principal Analyst at Ovum and Ben Werther, Founder and Executive Chief of Platfora will discuss 5 top trends in big data discovery for 2016. Discover how easy it is to solve crucial business problems and get actionable insights from raw data with Big Data Discovery. By automating automating and accelerating much of the data crunching and ETL work, Big Data discovery enables both data scientists and business analysts to do data preparation rapidly and simply–and ask their own questions and find their own answers. What’s more, answers come in minutes, not months. Modern enterprises are aiming to segment their customers by their unique engagement rates in order to influence buying behavior. But it’s challenging to slice the data by customer attributes and get insights when the data is coming from various sources. In addition to technology, hiring the right teams with relevant expertise in the rapidly changing ecosystem of Hadoop can be challenging. Watch and learn how Opower was able to leverage its data in Hadoop and unlock customer engagement insights quickly and easily using Cloudera and Platfora. • Opower’s non-technical engagement team easily filters customer engagement data to deliver fast analyses for its clients. • Opower saves time on data prep and spends more time on customer segment analysis for its clients with ease and limited overhead. • Opower extracts rich insights from data in Hadoop to understand customer patterns and relationships all within a single data hub architecture. Platfora is the leading full-stack big data discovery platform for Hadoop and Spark. Platfora brings together traditionally separate tools—data prep, in-memory acceleration, BI, analytics, and visualization—to streamline big data analytics and simplify data discovery. Join this webinar to see a detailed demonstration of Platfora and learn how you can get insight into your organization's data in minutes, not months. To be a data-driven organization, you need faster speed to insight. That process starts with self-service data preparation. This need for speed requires access to a wide range of information, including structured and multi-structured data, that allows for businesses to go from raw data to actionable analytics. But how do you choose the right big data infrastructure and analytical platform to ensure that your organization can engage in fast, iterative big data discovery? • Best practices to quickly prepare raw data in Hadoop and drive real-time analytics.